AAUW1: Taryn Wagner, a San Gorgonio Middle School student, completes a project designed to illustrate math skills during the AAUW’s annual STEM conference at Mt. San Jacinto College on Jan. 8, 2019. AAUW2: Xochiltlin Leal-Huerta and Bryannia Jordan, both Nicolet Middle School students, work on the geometry of bee hives during the AAUW’s annual STEM conference at Mt. San Jacinto College on Jan. 8, 2019. AAUW3: A group of 8th grade girls from Nicolet Middle School get a giggle out of a math project during the AAUW’s annual STEM conference at Mt. 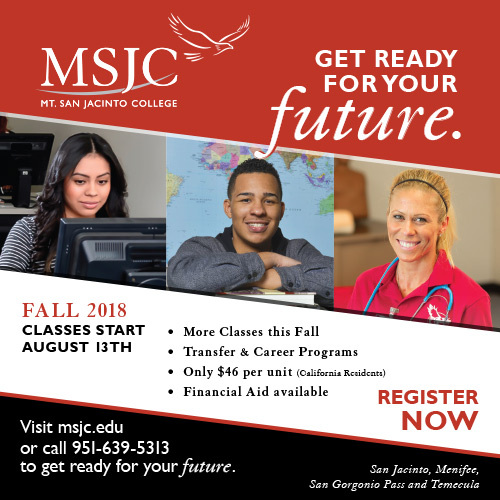 San Jacinto College on Jan. 8, 2019.